Recycling | GHC Reid & Co. Ltd.
Help keep our beautiful Island clean and green by bringing in empty soda cans, Vailima beer bottles and P.E.T.’s. Only used Beverage Aluminum Cans and Vailima Bottles! All recyclables should be free of heavy dirt, mold, foreign items and pre-rinsed prior to selling back to GHC Reid. We offer a pick-up service or you can drop off your Recyclables to our GHC Reid Tafuna warehouse. Please call 6991854. 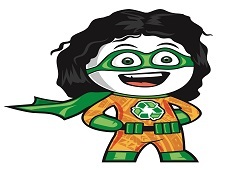 Our RECYCLE MAN will come around to pick up your Recyclables on the spot! Vailima bottles – did you know that Vailima bottles are the ONLY beer bottles in American Samoa that are returnable? This means that they can be collected back to be sent to the manufacturer, Samoa Breweries Ltd. to be re-washed and re-used for beverage filling. This helps to keep our beautiful island free of broken glass and trash. Returnable bottles are a heavier bottle that can be used up to 3 years. Used Beverage Cans – American Samoa bring in lots and lots of can beverages like sodas, juices, teas and energy drinks. We also bring in these beverage cans and as part of our stewardship to the environment, we buy back these used beverage cans. We then bale the cans and send it back to the US for recycling. Aluminum cans are one of the most recyclable materials on Earth… make the most of it by collecting and sending it to us to recycle. Don’t throw away your Vailima bottle or beverage cans, save it…that’s MONEY for you and the GREENER AMERICAN SAMOA for all of us!